Several times a month we invite you to meet a fascinating new person by reading a buzz-worthy memoir or biography. Have you ever dreamed of being able to fly anywhere in the world, whenever you wanted to and for free? Heather Poole is living that dream, but she might question the word free. After more than 15 years working as a flight attendant, Poole has paid for every glamorous-sounding perk, time and time again, simply by surviving the crazy, stress-filled life of her chosen profession. 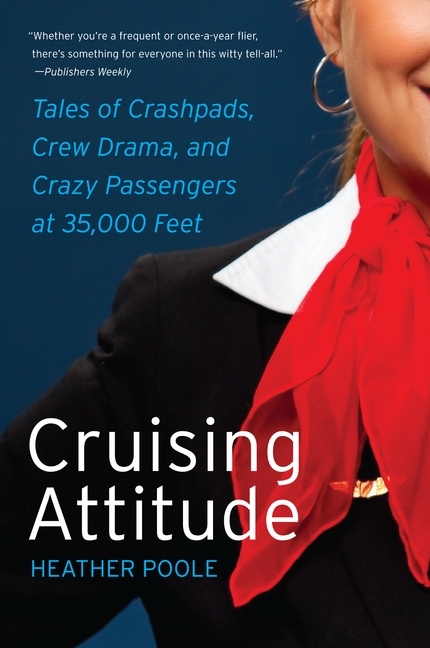 In her easy-to-read and engaging memoir, Cruising Attitude, Poole dishes on what it’s been like to devote her life to serving others in tight quarters and at 35,000 feet above the ground. This is not an exposé of the airline industry but a behind-the-scenes-look at a career that is more difficult and less profitable than you might imagine. Poole tells us about the grueling requirements of training school, the strict ladder of seniority flight attendants are bound to, and the difficulties of maintaining relationships (friendships and loves) when you’re always on the go. We also learn which flights have the nicest passengers, galley tricks to get around common problems, the most dreaded drink order, and why most flight attendants are germaphobics. No matter how experienced a traveler you are, Cruising Attitude will change your flying experience. Treat your flight attendants well. They may get to fly to Paris without handing over cash for the ticket, but they’ve earned that privilege by meeting and serving more than 72,000 passengers a year — smiling each and every time, no matter how difficult the circumstances.